Annabel is getting too smart for me. She knows which remote control changes the TV from cable to Yo Gabba Gabba and Sesame Street DVDs. When the phone rings, she can answer it. And my iPhone’s security systems are no match for her tiny fingers. She is fascinated by our computers, and when I have my laptop open she likes to come over to see what I’m doing. My mom once showed her a video of herself, and now all she wants to do is watch herself on my laptop. She’ll climb up on the couch next to me, point to the screen and say, “see Annie!” Except she pronounces it “Ah-knee.” She’s very pretentious. Of COURSE she’s figured out how to replay videos and select different ones. Mike doesn’t even know how to do that. But I was still surprised when she stumbled on a video of Maddie first learning to crawl. She was enthralled, exclaiming “Baby!” and then “Maddie!” She played it a few times in a row before I came out of my stupor. I pointed my web browser to different videos of Maddie to Annie’s great delight. I have no idea how long we sat on the couch, watching videos of Maddie. Annie clapped and laughed and squealed at her sister. I smiled at both of my girls, the older one entertaining the younger one. I was lost in thought when I heard Annie’s little voice say, “Maddie? Where Maddie?” I realized she’d clicked on a random video without Maddie in it, and that’s why she was asking where Maddie was, but I was still jolted. I quickly fixed the situation by putting on a new Maddie video. As Annie sighed and giggled, I thought about when she’ll ask me that question wanting a different answer. If only I could bring her sister back with a few clicks of my mouse. This must be so hard. Bittersweet. I can’t even find the words, without sounding like a complete tool. This post touched me deeply hon. Can’t fathom your depth of different emotions .. having this amazing sprite on your lap, looking at those divine eyes on the girl in the computer. Annie is a sweet, smart girl. The talk will be hard but you’ll make it over that hurdle a stronger mom and a stronger family. My heart…always with you. My wish…always that there was more. I feel your pain. Hugs to you! it’s so sweet and powerful the kind of bond that your girls have, no matter what. As hard as that must be, it’s also so powerful to see the special connection Annie has to her big sis from such a young age. Heather, you are a strong, courageous woman, and an excellent mother. I’m thinking about you and your two lovely little gals today. Both your girls are so sweet. Glad you have so many great memories recorded that can be shared with Annie. Also, be careful, Annie has a way of knowing how to change the orientation of laptop screens. I don’t even know what to say, but at least when that time comes her sister won’t be a stranger to her. She will already know so much about her, and love her, and feel like she knows her through you and Mike. I wish it was different for your family. Words escape me, so just know that I’m sending hugs your way. oh Heather, my heart aches for you. Sending more hugs to you. Annie is so sweet and loving. Just adorable. I have tears in my eyes Heather. I’m sure Annie will ask more questions as she gets older anout her big sister and I cannot imagine how difficult it will be to answer them for her. Hugs to you and Mike both. Heartbroken. I wish you could bring her back that easily too. Sending love and hugs to all of you. I am so glad that you have these videos of Maddie to share with Annie. Without them, it would be so hard. Your girls are lovely. Also, isn’t it amazing how quickly these little ones figure out technology? It’s insane! Annie;s love for her sister is SO evident! I’m happy that you have these videos to share with her. I wish that for you too. She may not understand now or in the next few years, but one day she will and when she does, she’ll be so thankful that you have instilled a memory of her sister that she would have never had without your help. my father died when i was just a baby, and i’ve only got about 3 pictures of him. it would be wonderful to have more pictures or images of him. you and mike love both your girls so much, that is clear in the way you enjoy both of them and the memories you’ve made with each one. though i imagine it must be very difficult, it’s beautiful to see how you help annie see that madeline is still a part of your family. Annie is so smart. I wish a few clicks would bring her back too. When the twins talk about their brothers what I have come to realize is that it is just part of their normal conversation. They are not sad at the mention of their names – just I am. . .Take care. You can take those files and get them put on an actual DVD. Extra way of saving them (though I assume you have backups of the backups of the backups), plus Annie would get the see them on the big screen. If you lived in Ohio, I’d know where to send you to do it. But I’m sure it can’t be too hard to find one out there in TV land. Anyway, that’s what I would do. You can get multiple files on one dvd. Though depending on how many videos and how long they are, maybe not all of them on one. But still. It is beautiful and bittersweet how Annie loves watching videos of her big sister. And it breaks my heart to think of how you’ll have to answer that question one day. Sending much love your way. She will ask that big question one day and you will answer it in terms that she will understand and then one day way in the future she will really ask and you will be able to show her this blog and show her all the pictures and movies that you have of Maddie and really explain to her how it is that you are all missing a piece of your family. I think she will be very grateful that you documented so much of both of their pregnancies and their lives, I know I would be. what a precious, but sad, moment. sending hugs to you all! Bittersweet. How sweet that she recognized her big sister! That made me so happy for you! Sad for you when she asked where she was, though. I’m so happy that she recognizes Maddie. Still…bittersweet. Awwww. I really think the absolute best word for this entry is bittersweet. How touching that she recognizes her older sister. Its a testament to how close you still hold her in your hearts and minds. I have been showing Q the annie videos for a long time and she will ask for them (baby videos peas! ), but. Shas now begun to recognize maddie (she pronounces it “miley”). Today wwe watched your tribute video and Q laughed as mike pretended to attack maddie and maddie fake screamed. When the video ended, she said, “bye bye miley.” These words are inadequate, but I am so sorry for your loss. 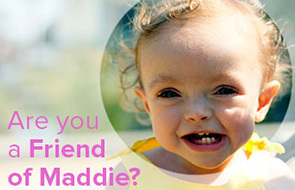 Maddie is a precious baby and her memory will live on. My heart hurts for you. I wish your wishes came true.